Some of you may find this too easy, others might struggle, so try to drop some hints about the species if you know what it is. Have fun! I don’t know how I can make a cryptogram of the name I have in mind, but could this be the prehistoric bird that looks like a great northern diver with teeth? But, more seriously, since we are now told it is a genus, which actual species is it? Or don’t they have names yet? Skull is exquisitely clear, more so than most – so if this is old wing, where are its feathers? That’s the thing though, isn’t it? We know of old wing thanks to a “type” fossil, that happened to have “wings” fossilised. But most old wings are, one presumes, as fossils, without the appurtenances of wings. Or even, as in this case, without any sense of a body structure. For “wings”, please read “feathers”. 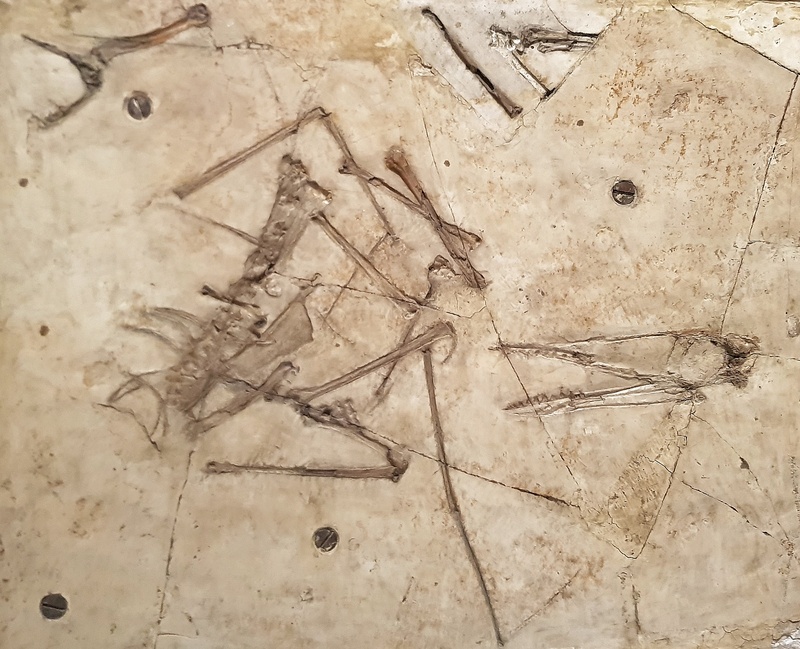 Most of the photos of fossil old wings I’ve seen have clear feather-shadows. I’m sure some don’t, but I just haven’t found them. The size and heftiness (lack of) in the one we have here certainly suggests bird . . . The extreme clarity of that delicate skull and the teeth led me to expect feather-shadows. Everybody else seems to think it’s a bird, so I’m probably just showing my ignorance, but… those very long, slender, bones make me think of pterosaur fingers more than anything avian. Good point. We don’t have Paolo’s classic metric scale for scale, so it could be a pterosaur. But… is that a single sheet of rock in which this fossil is preserved, and would that be a clue? Allen Hazen – I agree. In addition to the long slender bones, look at the flat skull – no indent before the beak. Pterosaur a possibilty. I’m looking – I believe some were very small. Seems to have a sternum? the skull shape plus sternum plus long front limb bones plus light skeleton and no feather shadows reads to me as small Pterosaur. There are several small species, apparently, but that’s as far as I can take it. Spider attack or a web of lies?